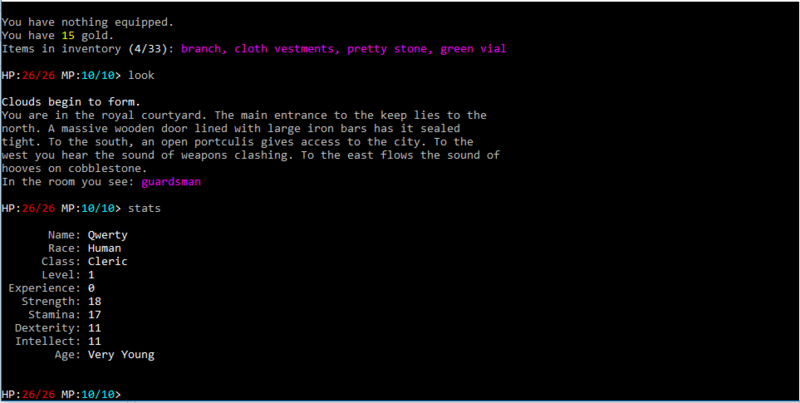 Welcome to the latest release (v0.106) of Shadows of Kalendale: A single player text-based MUD (SUD?). What started out as an experiment in the Python 2.X programming language, became a complete, text-based RPG, complete with races, classes, leveling, monsters, and of course, treasure! You begin the game by choosing a name, statistics, race and class, followed by an introduction to the game's story. You will find yourself in the city of Avalron. Avalron is a large city complete with a Blacksmith, Apothecary, Library, Training Academies, Church and dungeons. Within the game you will discover new areas, fight monsters, and collect gold and other treasures, all while improving your own skills and gaining levels. I wished to check it out. At least can you provide us a gameplay, so we can see what's going on there? The link has been update. We've included a link to the Microsoft Visual C++ 2008 Redistributable Package, which may be needed to run the executable. Hope that works for you! And does not work as previously, even reinstalled all versions up to 2010 and installed this one and not running on windows xp. And I am curious also to try it out. Unfortunately, it's as Igor said. I tried to install Microsoft Visual C++ 2008, and even exported the files to a folder, but no luck. I do use Windows 7 64-bit Professional. Maybe the file has a problem. Try using it in a different PC, and you'll figure it out. We've tested on a wide range of systems, including Windows 7 32- and 64-bit. The next alpha build Revision (00000.73) will include the required DLLs as part of the program manifest and not as a separate install, which should avoid any hassles. Stay tuned and thanks for your patience! I see. I'll wait for the 64-bit Win 7 updates. As for the side note, of all the files, I do have only the USER32.dll. We've rolled out Revision 00000.73 and you may want to try it now. However, if your OS is missing those DLLs, it still may give you issues. So you mean that you update the download link with the required files in it ? Yes, but only the Visual Studio (C++) files. The other files are OS files, and we do not have licenses to distribute them. Checked those files and I have all of them in folder and downloaded the game again, unfortunately I receive the same error message. What error message are you both getting? C: \ Shadow \ Shadow exe is not a valid Win32 application. Today's revision (00000.74) fixes an issue where it would not run on some 32-bit machines. Alright. It works. A nice storytelling, where it leads you to where you want to go. Unfortunately, there's not the command "Look Around" for clues or anything. It seems it depends to your memory. Glad it's working for you Since we're only in Alpha right now, there's a lot more content and features coming. oh, and let me tell you, that it works for MS-DOS. You could tell us that it works in MS-DOS system, so that we could get an idea of how it works and what requires it needs in order to start. I hope you include some pics in it, so that we can have a general idea of what's going on there, and have some elements, such as [Look Around], [Talk] etc, in it. BTW, I tried to press "Use [Item]" on the purse of gold, but it didn't work. :/ Hope you can fix it. Nice. Will try it out later to keep it up. Spellcasters finally get love in revision 79! Clerics and Sorcerers can now be played.